According to the Pew Research Center, 91% of Americans see public libraries as important parts of their communities, but only 22% are aware of “all or most” of the services that their libraries offer. Furthermore, a full 31% know “not much or nothing” at all about the services that their libraries provide. What does this mean for your library? Though you invest a substantial amount of passion, time and effort into your programming, your community members might be missing out simply because they don’t know what they’re missing! To help address this, we’ve collected five tips to help you increase your community’s library awareness. Read on for tips that will help you plan your library outreach and increase your community engagement. Angela Hursh, Content Team Leader in the marketing department of the Public Library of Cincinnati and Hamilton County (OH), reports that strategic use of social media has done wonders for driving usage of her library’s resources and increasing participation in events. Specifically, when she added Pinterest to the list of the library’s active social media accounts, she found that the platform drove a full 15–25% of web traffic. Her analysis showed that posts about new books and movies were most popular on this visual social media platform. LinkedIn was another popular channel, and posts about career and higher education resources see the highest engagement. One thing that Hursh recommends keeping in mind is the strategic part of your social media strategy. “We have to be on all the platforms,” she shared, “but we don’t want to burn ourselves out.” When Hursh first took on her content marketing position, her library wasn’t evaluating and evolving how it used social media — its main focus was on simply being active. The library is more successful now that it has a content marketing strategy centered around stories that connect patrons to the library. Regular evaluation to ensure that the content is helping the library meet its goals helps as well. Podcast Insights reports that 44% of the U.S. population has listened to a podcast, and 80% listen to an average of seven shows per week. Suffice it to say that podcasts are in demand! There are many different ways to leverage podcasts to drive library awareness. You could take a similar approach to Des Plaines (IL) Public Library’s Pint and Click, a show that features librarians and guests recommending books, movies, TV shows, apps and music. This approach will help you drive circulation of specific resources, while also highlighting the range of readers’ advisory services available at your reference desk. Westport (CT) Public Library, on the other hand, leverages this medium to allow patrons to participate virtually in programs and events. They offer digital recordings of their speaker series, which features bestselling authors and community leaders, so that those who can’t make the live events are still able to participate in this programming. This approach not only extends the reach of individual speaking events, but it also reminds community members to keep an eye on the calendar for upcoming sessions as well. While Des Plaines Public Library and Westport Public Library take a somewhat subtle approach to this library marketing, subtlety isn’t required when promoting your services in a podcast. Cook Memorial (IL) Public Library dedicates a whole segment of the Cook Memorial Public Library Podcast to highlighting the latest services offered by the library. If you’re having trouble deciding which approach to take, give them all a try, track listener engagement, and then determine what works best with your specific community. The old saying may be that “no man is an island,” but the sentiment rings true for libraries as well. You can increase library awareness by forming partnerships with local organizations that are similarly focused on supporting your community — there’s no need to work in a silo! Reach out to local community-focused organizations and ask to meet with them. Start with learning more about their mission and the initiatives they have in place. Then, brainstorm how you might work together. For example, you might be able to deliver outreach services onsite for certain organizations, such as storytimes, a traveling collection or STEM activities. Or, you might partner with a local museum and incorporate them into your summer reading program through research challenges. You never know what opportunities might develop when you take the time to listen and learn about what other organizations are doing. Once you develop a partnership, you have the mutually beneficial advantage of reaching a wider audience, and you can help spread the word about each other’s services. In the same vein, make it a priority to attend any forums that are led by local groups. These are great opportunities to learn more about your community’s needs and interests. In time, just by showing up, your library will organically become a key part of these conversations. Did you know that over 36% of the world’s population will likely use a smartphone by 2018, and the average smartphone user accesses over 30 mobile apps on a monthly basis? 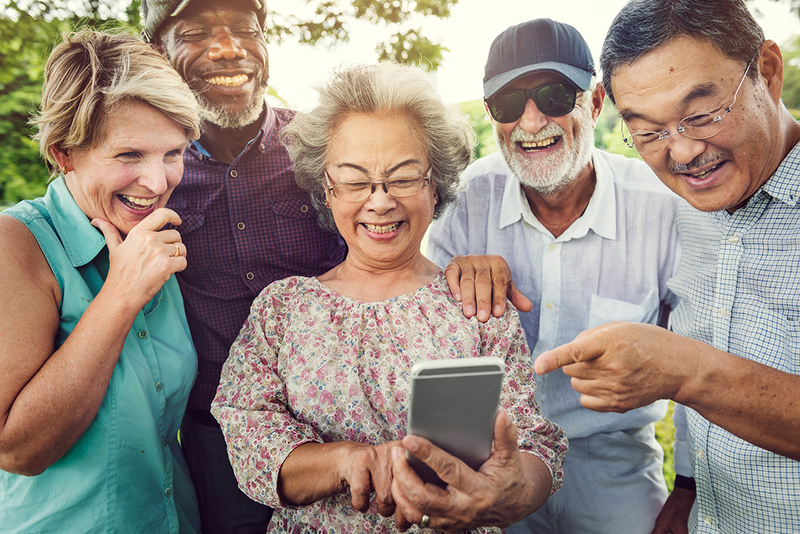 If your library’s programs, resources and services aren’t accessible via a mobile app, you’re missing out on a great opportunity to engage with your community members! With this trend in mind, the University of Pretoria (South Africa) Department of Library Services decided to launch a customized mobile app for its students and staff. Within just eight months of the launch, more than 10,000 individuals — an impressive 17.6% of the university’s students and staff — had downloaded the app. “We are excited that our app has taken off so quickly! It has increased our community engagement substantially in a very short time,” shared Elsabé Olivier, Assistant Director of Marketing and Quality Assurance and project manager for the app’s launch. Elsabé thinks the app was so successful because it allowed students to conveniently manage their accounts, search for online resources and find information about each of the library’s branches. Launching an app is a great first step that will take you where your community members are, but don’t stop leveraging this new connection after launch! Once it’s live, get creative with how you promote this (and any other) new service to your users. University of Pretoria took a unique approach to driving awareness of its app, one that could be repurposed to promote any of your library’s programs. In order to promote their app to a wide audience, they hosted a “pop-up library” in a well-trafficked area adjacent to its physical branch. “The pop-up library helped us to capture the attention of a large group of students,” shared Elsabé. Extend your own library promotion beyond your physical branch by staffing tables at farmers’ markets, in community centers or in other public areas frequented by your community members. No matter what library marketing initiatives you choose to undertake, keep the needs of your community top of mind. Don’t be afraid to try everything once! Track and analyze performance regularly, and you’ll be on the road to increasing your community’s library awareness. As Demco Software's Marketing Director, Kayla champions our efforts to educate public libraries on the need for a robust community engagement strategy. She works alongside our other teams to ensure that Demco Software's solutions effectively complement and amplify libraries' community engagement efforts.